If you want to observe the laws of physics and have fun doing it there is no better place than an amusement park. Not only can you see the physics taking place, but you can also experience the physics taking place, while sitting on the ride. I am currently working on an amusement park physics page and all I can say is, wow, there is so much out there. All amusement park rides are based on classical mechanics since they all deal with forces, energy, and Newton's laws, but the sheer number of different rides that exist is what makes this such a huge undertaking. If you want to see all the rides that are available check out this list of amusement park rides. No doubt it will take me a while to go through it all, but in my efforts so far I did gain some interesting insights about amusement park rides in general. All rides cause you to experience acceleration by way of the rides' motion. It is the magnitude and direction of this acceleration that causes you to experience a certain amount of g-force (as is commonly called) as you sit on the ride. A g-force of "1" is your body weight. A g-force of "2" is twice your body weight, and so on. Naturally, the higher the g-force the more "pressure" your body feels. 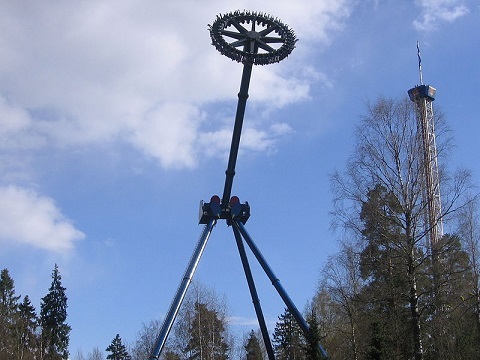 Ride designers want the riders to have as much fun as possible without generating excessive g-force, which can be dangerous. One way to do this is by making the radius of turns, such as on roller coasters, large enough to keep the g-force, caused by centripetal acceleration, within a reasonable range. Another way is to make different parts of the rides turn in opposite directions. For example, in the Zamperla balloon ride shown below, the main wheel spins in the direction opposite to the direction of precession. I'm currently analyzing the physics of this particular ride, and in the above video I figured out that riders experience a maximum g-force of about 1.5g (1.5 times their body weight) as they swing along the bottom of the main wheel. This is not too high and is intended mostly for kids and families. Now, if the main wheel rotation and the precession were in the same direction the riders would experience about 3g at the bottom of the main wheel. This is a big difference in the amount of g-force experienced by the riders. In fact, virtually all rides I have seen which consist of multiple rotating components have the rotations occur in opposite directions. This is to reduce the amount of g-force experienced by the riders. However, the rides still look very cool. Roller coasters, on the other hand, can produce some serious g-forces, as much as 3-6g. There are many types of ride designs consisting of all sorts of interesting geometry and motion, and some of them look downright scary. The Ultramax ride shown below is one of the scarier looking rides. It is essentially a giant rotating pendulum. Check it out. And if you're feeling brave try one out sometime.